Alarms have been our constant companion over the last few centuries. As routines became increasingly hectic, people responded by cutting down their hours of sleep. 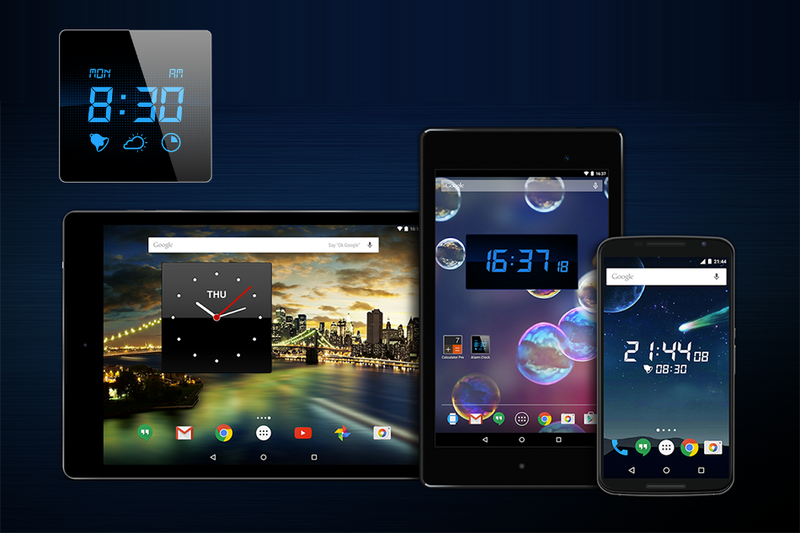 Also for other reasons alarms became highly popular amongst the masses and the format that you would most commonly find millennials using is in the form of apps. 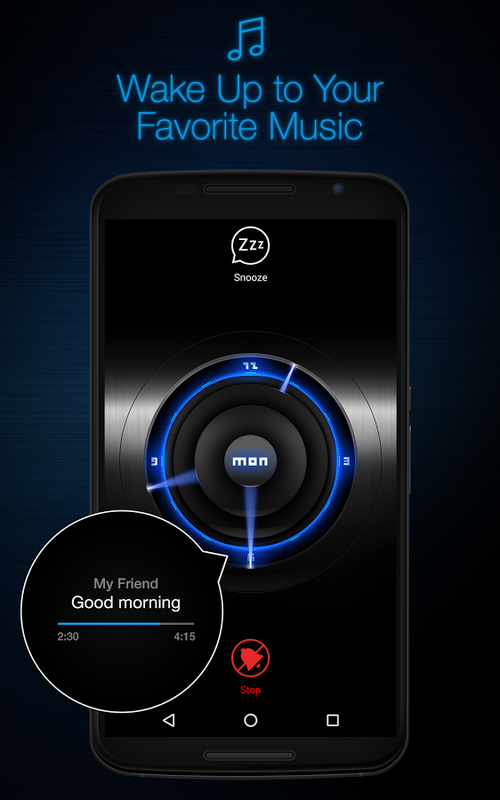 Among the numerous such apps available for the Android platform- the My Alarm Clock Free developed by Apalon Apps, a top developer as rated by Google, is deserving of special mention. When I first confronted the Google Play store page of this app, the initial impressions were favourable enough. It has over 10 million downloads, an indicator of its runaway popularity. Also, there were no fewer than 294,433 reviews at the time I downloaded the app. Amongst these, the overwhelming majority of 179,469 people gave it a solid five-star rating followed by a four-star rating by no fewer than 62,878. This indicated that the app was quite good if not exceptional. At least those were my initial impressions. The size of the app download stands at the near-about of 16 MB, which makes it a bit larger than most apps. When you first run the app it demonstrates how you may dim the app simply by swiping in the down direction. Next, you are faced with the message that the app is going to use your location in order to display relevant ads. The app is free but you have to put up with those ever pesky and annoying ads. With its cool colour combination of blue letters and digits on a black background, the app leaves nothing to be desired in terms of aesthetics. This neon blue colour effect is also put into use in the various controls of the app. In addition to the time, the app also provides the temperature and weather details along with wind speed in miles per hour. The app has four touchscreen controls which become visible when you touch the screen. Of these two are located in the top right corner of the touchscreen. These are the Settings controls and the help section. Notifications are placed in the bottom left corner, just above the ads and the sleep timer is situated in the bottom right corner. 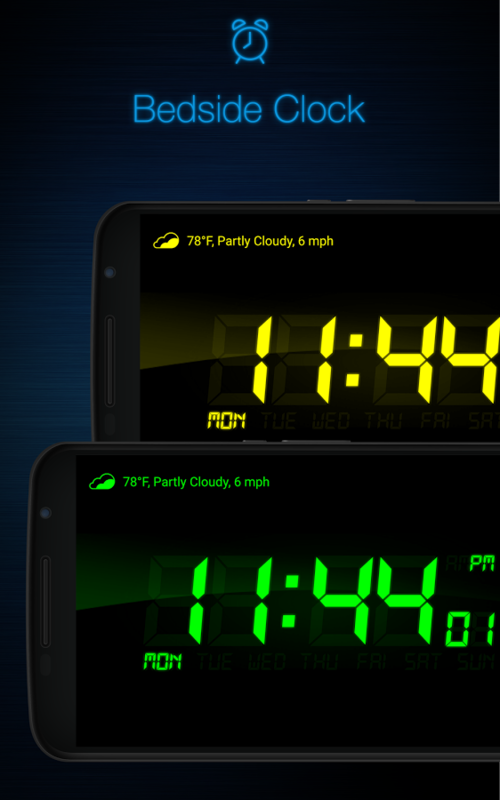 The app offers the display of time in a variety of colours in the digital clock style as well as five good looking themes which however are limited for only premium users of the app. The colours of the default digital theme happen to be green, blue, red and yellow and all of them make the clock quite impressive. • Some users claim that the free version does not output sound after a certain period of time which I have not experienced till now. A good download which gives you the option of setting your own music as the alarm sound and the features in the free version also suffice for most day to day purposes.